From loaded baked potatoes to Asian stir-fries and street-style tacos, dining options abound during Zags home games. Menu items don’t just fill the bellies of Bulldog fans, either. They help put money into the coffers of community groups – from programs at a local parish to club sports teams and senior parties at Spokane Public Schools. Gonzaga University’s McCarthey Athletic Center features 14 concession stands. Volunteers at 10 of them help raise money for their organizations through sales at their particular booth or cart. There’s a waiting list. And turnover is low. Working concessions at a Zags basketball game is no small feat. “We spend essentially two days getting ready for a game,” said Mike Schroeder, general manager of the Sodexo Sports & Leisure Team at the McCarthey Athletic Center. Lead volunteers are required to arrive three hours before the game starts. Doors open 90 minutes before tip-off, and helpers need time to set up, fire up the popcorn machines and get the burgers on the grill. Groups contract for a whole season and are guaranteed a stipend of about $200 each home game; typically there are about 38 men’s and women’s home games per season. Groups earn additional money based on sales; the more booths sell, the more volunteers make for their cause. Some of the most popular booths can make as much as $9,000 per season. Gonzaga contracts with Sodexo for its dining services, including concessions. The Sodexo culinary team – seven chefs in the main downstairs kitchen and another four manning stands on the second level – plans to potentially feed 6,000 people at each event. That’s how many seats there are at the arena, and games are generally sold out. “We’re hoping we’re going to sell to every single one of them – whether it’s a bottle of water or a bag of popcorn,” Nebergall said. Top-sellers include hand-carved roast beef and turkey sandwiches, rice bowls and gourmet hot dogs. In the student section, popcorn chicken is particularly popular. New for the 2016-17 season: Philly cheesesteaks, which have also enjoyed high demand. Also well-received: the $5 combo meal, which includes a small drink, small popcorn, small hot dog and crisped rice treat. It’s generally a hit with families with small – or many – mouths to feed. Main menu items generally range in price from $6 to $9. But don’t expect the $9 beer you find at other stadiums. There’s no alcohol for sale. The NCAA doesn’t mix hoops with hops. While it prohibits the sale of beer and all other alcohol in the general seating areas at NCAA-sponsored events, booze can – and is – consumed in restricted areas, such as luxury boxes and private hospitality rooms. Members of the Bulldog Club are invited to pre-game, half-time and post-game hospitality events depending on the amounts they’ve donated to Bulldog athletics. For other fans, Coke, Pepsi and Dr. Pepper products are available throughout the arena. Bottled drinks – soda, water, lemonade, tea, sports drinks – are $3.75. Fountain drinks are $4, or $4.75 for a souvenir cup. Plus, there are arena staples: regular hot dogs, popcorn, jumbo pretzels and ice cream. The menu is re-evaluated heading into each season. “We’re at a menu right now that people seem to be pretty happy with. They’re buying a good amount of everything,” Nebergall said. His priority during games is making sure concessions don’t run out of food. They’ve come close to running out of popcorn chicken, but it doesn’t take long to cook. Sometimes, it sells out almost as fast as it takes to fry. Here’s a closer look at where to eat at the McCarthey Athletic Center. Kennel Grill – Find Philly cheesesteaks at this permanent concession stand, located in the facility’s northwest corner. This is also the place to get hot, juicy burgers with a choice of Swiss, cheddar or provolone cheese as well as lettuce, tomato, pickle, onion and Thousand Island sauce. Patties are 1/3 pound. 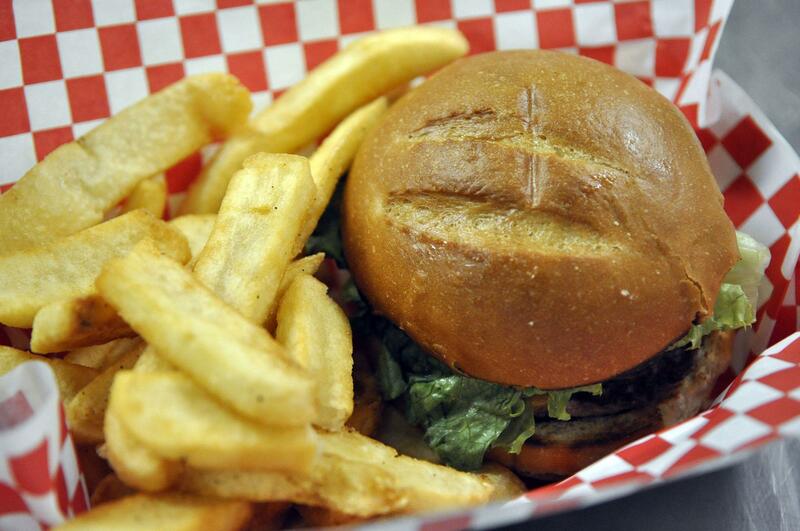 The brioche burger buns come from Le Petit Chat, a bakery in north Spokane. Burgers also come with thick fries, and fans have the option of getting them with a sprinkling of Parmesan. Both the cheesesteak and cheeseburger are $8.50. Fries alone are $3. There’s $5 kettle corn, here, too, as well as $4.50 nachos and $3 jumbo pretzels. The stand is staffed by volunteers working to raise money for North Central High School’s senior all-nighter. Kennel Carvery – This permanent concession stand in the arena’s southwest corner specializes in hand-carved roast beef and turkey served on a ciabatta roll from Le Petit Chat. When fans can’t decide, volunteers offer a sample of each. Some fans still can’t decide, so they special order sandwiches with a little of each. The stand serves about 200 sandwiches per game, sometimes as many as 300. Toppings include a choice of Swiss, cheddar or provolone cheese, as well as lettuce, tomato, pickle and onion and pesto mayo, stone-ground mustard and horseradish. The stand is staffed by volunteers working to raise money for various ministries at Our Lady of Fatima Catholic Church. Zag Dogz – This permanent concession stand in the arena’s northeast corner offers five gourmet selections. Each is $8.50. The Coney dog features an all-beef frank topped with chili meat sauce, chopped onions and yellow mustard. The Cali includes a smoked apple-cheddar-chicken sausage topped with bacon, avocado, pico de gallo and chipotle ranch dressing. The Southwest dog includes bratwurst, bacon, chili with beans, pico de gallo and sour cream. The Asian dog features smoked apple-cheddar-chicken sausage with slaw and peanut sauce. And the Greek dog includes sweet Italian sausage, cucumber, feta, tzatzki sauce and kalamata olives. There are regular hot dogs, too, for $4.25 each. The hot dogs come from Longhorn Barbecue in Spokane. The buns are made in house. The stand is staffed by volunteers working to raise money for Spokane’s Crew Baseball and Crash Softball clubs. North and South Main Concessions – Find popcorn chicken for $6 as well as pretzels, popcorn and combo meals at this stand. The north stand is staffed by volunteers working to raise money for the senior all-nighter at North Central High School, south for the senior all-nighter at Central Valley High School. Southeast Core Favorites – There’s no popcorn chicken at this stand, but there are a lot of other ballgame favorites. The stand is staffed by volunteers working to raise money for the senior all-nighter at West Valley High School. Kennel Creations – This portable cart on the south side of the arena specializes in Asian stir-fry. Customers choose one of two bases – yakisoba noodles or white rice – as well as either General Tso or sweet-and-sour sauce. The dish comes with chicken, but can also come meatless. Veggies – mushrooms, bok choy, sprouts, onion, carrots, snow peas – are sauteed on site with garlic and oil, and garnished with twirly, blanched golden beets and cilantro. Stir-fries cost $8.50 each, and the cart goes through about 100 orders per night. It’s staffed by volunteers working to raise money for Rogers High School. Kennel Fiestas – This portable cart has two locations because it’s so popular: one on the south concourse and another on the north concourse. Both feature an array of Mexican-inspired fare – street-style tacos (two 6-inch for $8), the 12-inch Bulldog Burrito ($8.50), loaded nachos ($8.50), Fiesta Salad Bowl ($9) – as well as loaded baked potatoes, which cost $6.50 and come with butter, bacon bits, chili con carne, shredded cheddar, chili con queso, sour cream, broccoli, chives and salsa. For the south-of-the-border fare, customers can choose from smoked pulled chicken and shredded beef or opt to go meatless. Sour cream and guacamole are sides. These two carts are staffed by volunteers working to raise money for Rogers High School. Dippin’ Dots Ice Cream – The cart sells tiny, flash-frozen balls of ice cream and is located on the north concourse near the Kennel Grill. It’s staffed by volunteers working to raise money for Rogers High School. The following four stands aren’t staffed with volunteers raising money for local programs. Ben & Jerry’s Ice Cream – At this portable cart, located on the south concourse near the main entrance, waffles cones are made fresh on site. Kettle Corn – This portable cart is located on the east concourse near the main entrance. Wake Up Call Coffee – This portable cart can be found on the east concourse. Papa John’s Pizza – This portable cart can also be found on the east concourse.